Casa Azafrán offers colorful, airy meeting spaces to inspire creativity and collaboration. On-site catering available from our Mesa Komal Chefs. Contact Andrea Aquirre-Solis at 615-320-5152 or andrea@conexionamericas.org with any questions. *tables included are 18″x60″ and can be arranged several ways. Chairs are stackable and bright colors. We can recommend outside vendors for other table and chair needs. 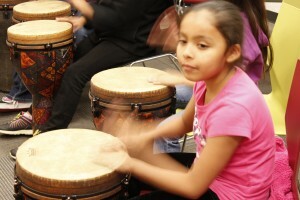 Join Charlie in the Global Education Center studio for a great, fun class of World Percussion. Class is held Mondays at 4:30 p.m. and Wednesdays at 5:30 p.m.
Join us for a very fun class! 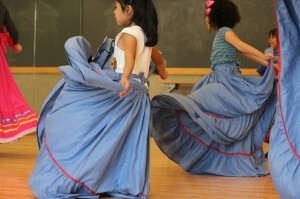 Ballet for Children with Andrea Solis – Saturdays at 1 p.m.